Long before content marketing was a buzzword, Joe Pulizzi was working behind the scenes in custom publishing for Penton Media in North America to help brands and businesses grow. He’s the founder of the Content Marketing Institute and the content marketing magazine Chief Content Officer. He’s also the author of four books, including Killing Marketing: How Innovative Businesses Are Turning Marketing Cost Into Profit. Q: What is content marketing? A: Think of it like this. Instead of a company using traditional advertising mediums to promote products and services, it uses content. For that to happen, the company’s marketing department operates more like a media company. Q: How long has content marketing been around? A: More than 100 years. I always like to throw out the example of John Deere starting a publication back in 1895 called, The Furrow Magazine. It was basically a magazine to help farmers with the operational challenges of running a small farm. Instead of talking about their products and services, they talked about issues related to help farmers with their careers and their lives, and technology around farming equipment. Even though that was in print, that’s kind of the first representation of brands acting like publishers. Q: How does content marketing work on social media? A: If you have something interesting to say on social media, it can draw people to your brand. It’s one content marketing strategy that works to engage people and develop loyalty by providing great information. Ultimately, it can provide a way to sell your products and services. Q: Is there a company doing content marketing well? A: About 90 percent of all organizations are doing some form of content marketing. For some, it’s a small effort like regular blog posts. Or it could be a real approach like Red Bull. They publish a print and digital magazine, called the Red Bulletin, that’s sent to 5 million subscribers around the world. And they publish a regular e-Newsletter, blog posts, eBooks, and white papers. Q: What should freelancers know about content marketing? What do you want people to do after consuming this content? Are you trying to generate leads or keep customers longer? Are you trying to shorten the sales cycle? Q: What matters most, volume or quality of content? A: More is not always the answer. It’s usually consistent, high quality, very focused content that helps somebody with a task. Or helps them with their lives or their careers, instead of just content for content sake. A lot of companies think content marketing is just talking about their products and services, and it’s really not. Q: How do you get into content marketing? like to travel with their pets? Focus on your niche to become the writer for your industry. That’s where you get higher paying gigs or you really get agencies and brands that look to you as an expert they want on their writing team. Q: How do you market yourself as a niche writer? Leverage SEO. I’m not saying everybody has to go out and start a blog. But you need a content platform, and you need to own that platform. Learning the basics about search engine optimization for everything you write to promote yourself will help you get found on Google. Network on social media. Build a social network in your niche area. Find out who the influencers are. You can use tools like Twitter, Twitter hashtags, Google tools and alerts to find out where your people are hanging out online. Then connect, build relationships, share your content, and guest post for free. Giving wonderful, outstanding, truly helpful, free content will position you as a niche expert to land paying gigs. Today’s writer has to be social media savvy. If you can show that, you jump to the top of the pack, and clients will call you back. Q: What’s your outlook on content marketing opportunities for freelance writers? A: There’s never been more opportunity than there is right now. It’s just different than it used to be. Freelancers we’re all our own little start-ups. We’re all our own little entrepreneurs. Start thinking of yourself as your own little media company. The higher profile you can get and make for yourself online, the more revenue opportunities you’re going to have. If you’ve been thinking about boosting your online profile, updating your blog, or building relationships to land content marketing gigs, it’s time to take action. If you want to write for custom pubs, trade pubs or the leading brands in your niche, now is always a good time to start. 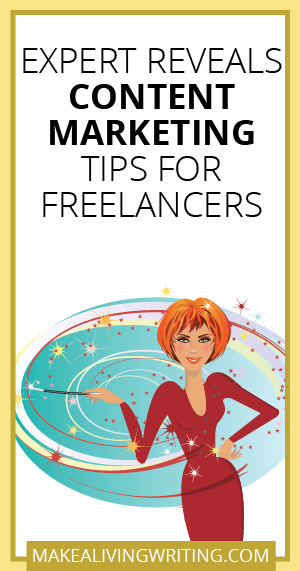 Questions about content marketing for freelancers? Let’s discuss on Facebook and LinkedIn. Evan Jensen is the blog editor for Make a Living Writing. When he’s not on a writing deadline, or catching up on emails, he’s training to run another 100-mile ultramarathon.